Coxarthrosis of the hip joint — a severe form of osteoarthritis, a disease that in medical practice the most common and accounts for over 40% of all diseases in the musculoskeletal system. This disease mostly begins to develop after age 40 and men and women. However, in women this disease is more severe. Coxarthrosis is a deforming arthrosis of the hip joint, which can be successfully treated in the early stage of development. But, unfortunately ill not strive to immediately seek the assistance of the doctor, feeling the first pain in the hip Charter. Thereby allowing the disease to progress. the main cause is poor circulation, when the deteriorating venous outflow and arterial inflow. So that there may occur accumulation of metabolic products, and oxidized, begin to activate the enzymes, which subsequently begin to destroy the cartilage. important mechanical factors. This overloading of the joint. The bulk of such overloads suffer professional athletes. As this disease affects people who are overweight. biochemical changes in the cartilage matrix. Violation of metabolism in the human body. And, of course, hormonal changes in the body. injuries. It’s a traumatic dislocation, hip fracture, various fractures of the pelvis. It was after injuries of the hip can begin to develop in people of young age. the development of aseptic necrosis of the bones of the pelvis. inflammation of the joints and infectious processes. congenital pathology. A developmental disorder of the joints. congenital dislocation of the hip. For this reason, the development of osteoarthritis occurs in over 20% of people. the heredity of the organism. Of course, the disease itself is not inherited, but is transmitted skeleton structure. And if your relatives are suffering from coxarthrosis, that is, the probability of occurrence of such diseases increases several times. Osteoarthritis can be either primary, as an independent disease, and secondary, which occurs as a consequence of other diseases. In the nature of common damage in both hip joints – bilateral coxarthrosis. constant pain in the hip joint, in the knee, which do not cease even at rest. with more neglected disease bad leg gets shorter. The mistake people make is that they ignore the first and main symptoms – pain in the hip, believing that pain can pass by themselves. However, it is a great mistake because of the hip at the initial stage easily and successfully treatable. But most patients when pain is not possible, there comes a restriction in the mobility of the feet, occurs the destruction of the hip joint, atrophy in the thigh muscles. Such symptoms may be and other diseases, so diagnosing coxarthrosis can only be a specialist and the appointment of effective methods of treatment are fully under the responsibility of the physician. 1 degree is characterized by strong recurrent pain that can occur after prolonged physical exertion. The pain is concentrated in the hip region. After a rest the pain subsides. If an x-ray, it is possible to detect initial changes in the bones of the pelvis. The joint space is narrowed unevenly, gradually revealed a slight proliferation in the bone.. But the neck of the femur and the head is still unchanged. Stage 2 – pain becomes more intense. Now the pain does not pass even at rest, give in the groin and thigh. The long walk appears limp. To fully function at the joint is not obtained. If an x-ray, it is already clearly visible progressive bone growth. Started deformation of the head of the thigh bone. It may have irregular contour or very increased in volume and move upwards. It is possible to detect the formation of cysts. There is a thickening, and dilatation of the hip bone. Stage 3 – is characterized by constant severe pain, unrelenting even at night. Walking already support is needed. Atrophy of the muscles of the buttocks, calves, thighs, and movement in the joint is limited. At this stage of the disease is the tilt of the pelvis that is causing shortening of the leg on the affected side, so you have to walk on the toes and torso on the affected side. And this leads to excess stress in the diseased joint. If we consider x-ray, it is possible to detect the abundant bone growth. Moreover, the joint space disappears completely, the joint can heal into one bone structure, as a consequence, a total loss of the property. The neck of the femur as extended. To diagnose the disease can only the attending physician, with clinical and radiological data. With the help of research it is possible to establish the degree of development of the disease, its etiology. With the help of x-rays have the ability to establish an accurate diagnosis, and hence to assign an effective treatment. The important thing is that this would be dealt by a specialist only. The treatment of coxarthrosis of the hip joint. 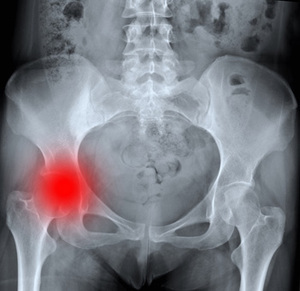 When the disease osteoarthritis of the hip joint diagnosed by specialists treatment. In any case, not zanimaytes self, not look for options how to treat osteoarthritis on your own. Consult your doctor! When 1 the degree of disease in preference to conservative treatment, using a variety of medicines and drugs (nonsteroidal anti-inflammatory drugs, muscle relaxants, chondroprotectors and other drugs). NSAIDs — good pain in coxarthrosis, relieve swelling and inflammation of the joint, thereby relieving pain. Muscle relaxants relieve muscle spasms, stimulate blood circulation, and chondroprotectors help restore the affected cartilage. These medications are used as a pills and injections, depending on the degree of pain and doctor’s appointments. In the treatment of coxarthrosis of the hip joint as well help folk remedies. The use of traditional medicine is possible in combination with conservative treatment, but you should consult with your doctor. Such a combination usually gives good results. Basically, applying ointments, tinctures, lotions folk medicine may relieve pain, spasm, inflammation, but the therapeutic effect they can provide. Of considerable importance in the treatment of coxarthrosis have physiotherapy ( laser therapy, medicated bath, acupuncture, mud therapy, massage, gymnastics). The choice of exercises is carried out with great care and only an expert would in any case not to cause injury to the affected joint. When the first and the second degree of development of the disease applies, debridement arthroscopic – surgery, which removes small particles of the destroyed cartilage. This helps reduce the pain and reduce the stiffness in the joint. Periarticular osteotomy is a surgery in which the femur podpilivaya in certain places, and then re-connects at a certain angle that allows you to slow the progression of osteoarthritis. Treatment of coxarthrosis 3 degrees in nearly all cases of surgery, because the recovery of joint conservative method impossible. Is a very difficult surgery to replace the joint with a special prosthesis, which is implanted in the pelvic and thigh. Such a prosthesis provides full life-activity of man, because it is a complete copy of this joint and has its characteristics. A great advantage of the use of therapeutic exercises in the treatment of coxarthrosis is that they can be fully and regularly perform at home. Disability in coxarthrosis of the hip joint: how to group?